Manufactured products accounted for 43.6 percent of the country's total exports in 2017. 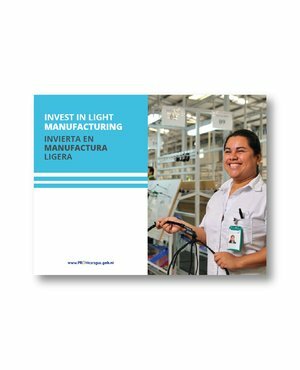 The light manufacturing industry is an important economic engine and one of the most dynamic sectors of Nicaragua’s economy. The manufacturing of goods has come a long way in diversifying its processes, becoming increasingly sophisticated. Nicaragua's light manufacturing industry has evolved to include even higher value-added operations, such as the manufacture of medical devices. The production of these products shows a continuous growth in our country, evidenced by the expansion of manufacturing companies such as Command Medical and Medisut, which specialize in the production of needles, catheters, cannulas, and general surgical devices. The magnitude of the market in disposable surgical products and articles as explained under tariff code 9018 proves that Nicaragua has a consistent production capacity for its competitive labor force and the ability to access the world's most important markets. Nicaragua is emerging as a very attractive platform for footwear manufacturing operations. Currently, the country exports leather footwear, synthetic sandals, rubber boots, and industrial footwear. The main export markets are currently the United States, the European Union, Costa Rica, and Panama. An important niche where Nicaragua is particularly competitive is the manufacturing of leather footwear and its export to the US market since it has a flexibility benefit from DR-CAFTA. This benefit allows the usage of non-originating raw materials and applies for the HTS code 64.03. The export of automotive harnesses grew by over 25 percent during the 2012-2017 period, becoming one of the most important activities within the National Free Trade Zone System. Automotive harnesses are one of the main export products, representing 11 percent of the country's total exports. Additionally, the country offers diverse investment opportunities related to the manufacture of auto parts in Nicaragua, such as carpets, linings for seats, interiors, among others. Two of the world's largest manufacturers of auto wire harnesses --Yazaki from Japan and Dräxlmaier from Germany -- have established successful operations in Nicaragua, supplying world-renowned brands such as Chrysler, Ford, BMW, and Volkswagen. Nicaragua has become an attractive destination for other manufacturing operations ranging from furniture manufacturing to the assembly of medical devices and appliances.